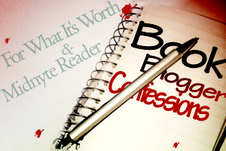 Book Blogger Confessions: Vlogging ~ Love.Life.Read. Vlogging. Have you ever vlogged (video blogging)? Why or why not? What do think makes for an interesting vlog? How does a book review vlog compare to a written review in your opinion? What are few of your favorite book review/author vlogs? I have been thinking about it quite a lot. I do A LOT of book talking at work so it seems like it would be a natural segue way into using it here on my blog as well. I do occasionally watch vlogs but not a lot of them honestly. What usually engages me are the ones that are clear to understand, well paced and that --make sense--nothing surprising in that I imagine. I cannot speak to favorites yet but as I do my research, perhaps I will stumble upon a few. I am looking forward to getting and reading recommendations, so feel free to post away in my comments section. Do you vlog or have an interest in trying it? If you have any tips or recommendations, be sure to let me know. I like when bloggers I follow will occasionally post a vlog because I like to see a bit more of their personality... but I just don't have the time (or perhaps the attention span) to watch them all the time. If you do a lot of book talking at work, it may help you when you are finally ready to do a vlog. I am pretty self-conscious, and I did one. I was amazed at myself actually, lol. And I agree, I think the best ones are clear and concise. I'm not a huge fan of vlogs but the shorter book haul ones are fun. I've never watched one for a book review.